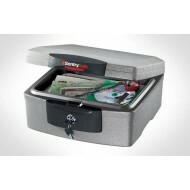 The Sentry H2300 Sentry security chest provides protection from both fire and water. A continuous 360° jamb and waterproof seal completely insulates the interior from the threat of water invasion. Fire protection includes UL classified fire endurance for 1/2 hour as well as ETL verification for 30 minutes of fire protection of CDs, DVDs, USB drives and memory sticks up to 1550°F. A full-time spring latch seals the unit even when it is unlocked. The CHW30200 provides protection from both fire and water. A continuous 360° jamb and waterproof seal completely insulates the interior from the threat of water invasion. A full-time spring latch seals the unit even when it is unlocked. Easy to take with you in an emergency. This product has been discontinued, please see substitution products below, if applicable. Call us if you have questions. 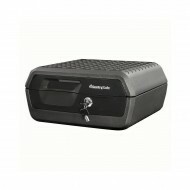 The F2300 provides protection from both fire and water. A continuous 360° jamb and waterproof seal completely insulates the interior from the threat of water invasion. A full-time spring latch seals the unit even when it is unlocked. Easy to take with you in an emergency. 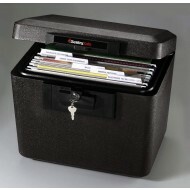 The Sentry 1170 is set up to hold file folders. It is small enough to be easily portable in an emergency. The Sentry 1170 carries a UL 1/2 hour fire protection label for documents. In addition, it is ETL verified for 1/2 hour fire protection for media such as CDs, DVDs and USB drives. This file comes in black only. 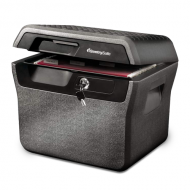 The Sentry FHW40200 is set up to hold file folders. It is small enough to be easily portable in an emergency. The Sentry FHW40200 carries a UL 1/2 hour fire protection label for documents. 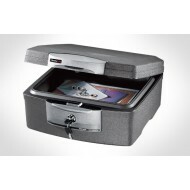 In addition, it is ETL verified for 1/2 hour fire protection for media such as CDs, DVDs and USB drives. This file will also protect your safe against water. This file comes in black only.